Common throughout England and Wales with scattered, mostly eastern, records across Scotland including the Western and Outer Isles. One of the most common Amara species, found in dry, open habitats sometimes in company with A.aenea DG., less often so with A.plebeja Gyll. Although diurnally active in warm weather it is less frequently seen than other Amara species; it seems, at least in our experience around Watford, to be less 'open' in its haunts and behaviour, that it is no less common than A.aenea will be revealed by pitfall trapping in suitable habitats. As with many Amara spp., most abundant in the spring when the species breeds. 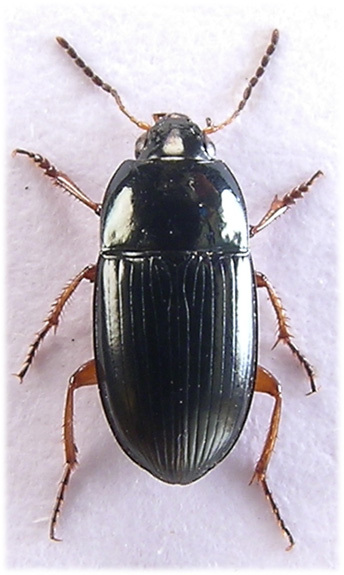 Found throughout the Watford area on parkland, farmland and wasteground, less often so from the town centre and gardens where a favoured haunt is along the base of walls and fences, especially when the temperature is high ¹, several have been found among the many carabids active through the night on Cassiobury park pathways (June 2006). 5.5-7.2mm. Generally identifiable in the field with a X10 lens, the beetle usually has a weak metallic lustre over a black ground colour so appearing less bronze than other Amara, and the legs are entirely pale. Antennae black or piceous, segments 1-3 (third sometimes darkened apically) and base of 4 yellow. Basal segments of palpi yellow. Head and pronotum shining, without microsculpture (X20). Two setiferous puntures on inside margin of eyes. Front angles of pronotum protruding, distinctly angulate ², lateral margins with strong border which continues onto front and hind margins becoming obsolete medially. Basal fovea represented only by weak depressions or (inner) sometimes an indistinct streak among a few punctures, setae at hind angles removed a little from lateral margins. Sides smoothly rounded, hind margin sinuate. Elytra a little less shiny than pronotum, microsculpture evident at X20. Scutellary stria without pore at base, as well impressed as adjacent ones although it may be interrupted or abbreviated. All striae deepened apically so that interstices appear to become convex- view from behind. Small and sharp shoulder tooth present. Seventh stria with 2 punctures near apex, the posterior sometimes indistinct among 'waves' in the stria, in line with these another puncture is usually (indistinctly) present at the apex of the first or second stria. Epipleurs crossed. To appreciate the pale legs view the beetle from the side in strong light so that they contrast against the black undersurface. ¹ Not very useful simply quoting 'high', we know, but we are in the process of recording carabids and night temperatures in order to find out which nights are good for recording and which are not. Had the weather in 2007 been better we may have had results to post, suffice to say when it's wet and cold don't bother. ² In the similar A.lucida Duft. the pronotal front angles hardly project and are rounded.